New version - 7.5 X 9.25 format with pictures! By the end of World War II, the troop carrier mission was fully recognized as one of the air force's three combat missions, the other two being fighter and bombardment. In 1947 the US Air Force was established, and Air Force troop carriers became responsible for the air lift of supplies into the blockaded city of Berlin less than a year later. In 1950 troop carriers began operations in Korea, then in French Indochina - although their role there was clandestine. In the 1950s Tactical Air Command troop carrier squadrons were the key element in the new doctrine of instant response to overseas "trouble spots." Then came Vietnam. Yet, in spite of the tremendous record achieved by troop carrier crews in World War II, Korea and Vietnam, very little has ever been published about it. The few books devoted to airlift have been written about the role of the logistical mission of the Army Air Transport Command and its successors, Military Air Transport Service, Military Airlift Command and Air Mobility Command. The larger and militarily more important role of the troop carrier mission - it was redesignated as "tactical airlift" in 1967 - has been ignored. The author, who spent eleven years in Tactical Air Command and Pacific Air Forces troop carrier/tactical airlift squadrons and MAC military airlift squadrons, began work on this history in the early 1990s. drawing on sources such as the official history of the US Army Air Forces in World War II, Ennis Thompson's book on 315th Air Division operations in Korea and the US Air Force Office of Air Force History volume TACTICAL AIRLIFT in it's Southeast Asia series. The information related in this work can not be found in any other single source. Anything, Anywhere, Anytime is in production and available for purchase. For signed copies, send $31.95 (includes postage and handling) to Sam McGowan, 3727 Hill Family Lane, Missouri City, TX 77459. To order with Trash Haulers, send $56.00, make it $75.00 to get a copy of The Cave as well. Order from the publisher and from online booksellers such as Amazon.com (see lnk above), Barnes and Noble, BooksAMillion, Powell, etc. . Electronic versions are available from the publisher and for Kindle and Nook. SAM: IN SPITE OF THE TURBULENCE AROUND THIS LAST YEAR, I FINALLY FINISHED ..ANYTHING, ANYWHERE, ANYTIME A SUPERB EFFORT ON YOUR PART, MY FRIEND. A PERFECT SCENARIO OF MILITARY AIR TRANSPORT FROM TINY BEECH C-45'S TO C-130 MONSTER JETS WHAT YOU HAVE DONE IS CHRONICLED HOW THE US AIR FORCE HAS GENERATED THE LARGEST AIR LINE THE WORLD HAS EVER SEEN. THE MEN WHO ACCOMPLISHED THIS MAGNIFICENT FEAT COULD FORM AND OPERATE ANY AIR LINE IN ANY COUNTRY IN THE WORLD. OF COURSE, I AM ESPECIALLY PROUD OF THE SMALL PART MY FATHER PLAYED WHEN GENERAL BRERETON GAVE HIM HIS ORDERS IN DECEMBER 1941 TO "TAKE YOUR PLANES AND CARRY MEN, MATERIAL AND MESSAGES AROUND THE PHILIPPINES, DUTCH EAST INDIES AND AUSTRALIA.." HIS PLANES WERE TWIN BEACH C-45'S THAT WERE LICENSED TO CARRY FIVE PASSENGERS AND TWO PILOTS. FROM THAT TO WHAT THE MILITARY AIR TRANSPORT IS DOING TODAY IS WHAT YOUR BOOK IS ALL ABOUT. 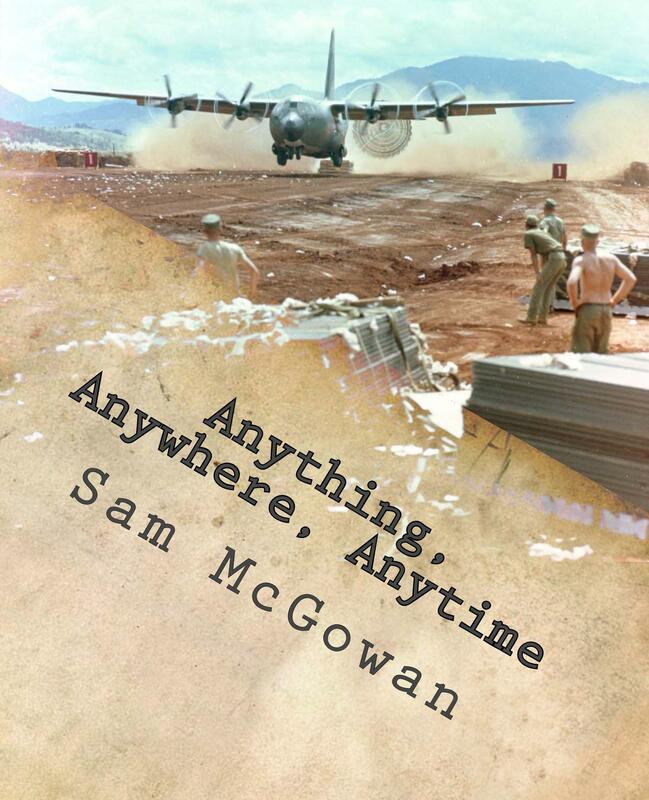 Go to Sam McGowan, Author for information on other books.